I'm experiencing a few issues with the sequencer. The encoder is not working, I've read about this here and burnt the Atmega again a few times with a .bat file supplied by Vincent which contains the latest FW with no change, I've checked continuity and all is good. Should I be burning the firmware, alone, with a TL866? Or should flashing the .bat file be enough? The second issue is when in tap mode each instrument is triggering the kick and intermittently other instruments, this includes ACC/TRIG etc. When in step/play mode I also experience intermittent triggering of other instruments but not as bad. I've taken this build on which had gone as far as having the PSU/IN/OUT board complete, Noise, Kick and the sequencer parts needed for testing built. I was told that at one stage he had tested the voltages and he measured ±30v. After cleaning up his work and completing the build I decided to change all parts which sat on the PSU rails which had probably been damaged from the high voltage. I tested with his Atmega which was fried so have since burnt a new Atmega. Last edited by serum114 on Feb 25th, '19, 15:34, edited 1 time in total. So after lots of scoping, checking parts and traces, desoldering and swapping out ICs I've had no change, until I decided to just have a play with it. 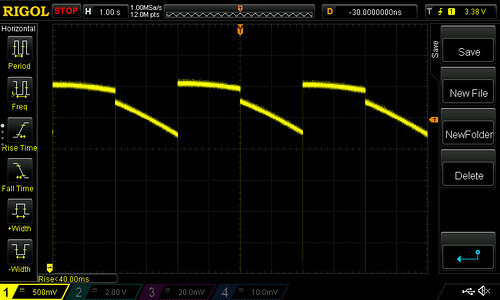 I've found that its the PC-2 part causing the sequencer to go bad. With various positions of the pots I seem to get different results with different instruments triggering and instrument faults, in other positions it all seems to work well. I've checked all the parts of the PC-2 (except the transistors which were checked before soldering) including the pots and ICs. The decay pot range seems off, going from really snappy to its max setting by 11 o'clock then no change all the way CW, also its bleeds through the master. It is causing the kick to have a ground loop issue and also overdrive with certain knob positions, the cowbell tune to go off a semitone and some other strange things to the snare. I still haven't managed to get the encoder to work so I ordered a TL866 but I think I would be desperate to think it will cure anything other than the encoder (I really am desperate...). Any thoughts here? I'm going to add this to the hardware part now so apologies for the double post. Since this I've pulled PC-2 and BD from the power rail and now I am experiencing permanent faults on the other voices. Ground noise on toms, ENV time is too long on the CB and CL, and other strange behaviour. I've re burnt the Atmega which fixed the LED behaviour and encoder issue. Great to ear that burning your µC solved the encoder and leds issue. About ground noise it seems that you have a faulty power supply or rail. 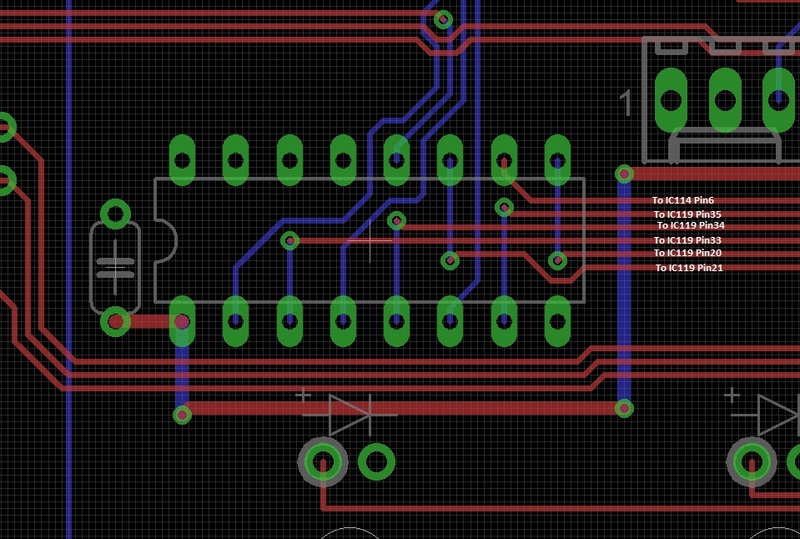 Disconnect the IO board power supply connector and check +15V, -15V and +5V rails. Then disconnect all 0ohm resistors on each instruments. You should find a faulty instrument. I've gone through all of that and it all is good up until the clap which is causing the issues I've described. I've checked all the work and parts and it's all good. After, I removed the clap from the ±15v rails and then carried on with the other instruments. The CB, CYM, HH and PC-2 all seem to have stopped working... Next was to remove the BD, SD, TOMS and RS from the rail and test again the other parts. All not working. I then looked at the ACC parts again in 'Normal' play mode with the known working parts and noticed odd accent behaviour and instruments triggering each other and varying accents each time a trigger happens, I scoped the ACC IN of the BD with only a BD trigger in the pattern (see img below). This same trigger was seen also at the SD and is also triggering the TOMS and RS, this is my area of concern. I added back the CYM/HH/CB removed IC3 and directly added 5v to the ACC input on each of these instruments and let the sequencer trigger and all worked fine. I tested PC-2 which also worked and the clap which didn't work (I ensured the correct parts of the buss were connected). I removed the clap again and tested as previously described the kick which also worked with CB, CYM, HH and PC-2 on the rail. 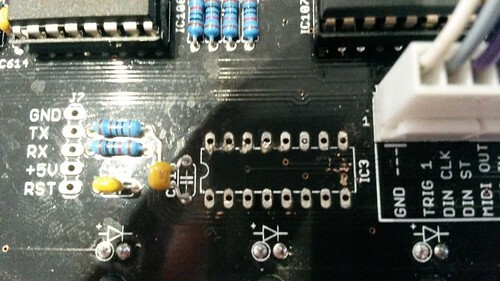 I've de soldered the IC socket at IC3 (see img) to check the damage again and I think I want to make a better job there even though continuity checks out good I'm wondering if maybe crosstalk is something that could be a problem here? My thoughts are to cut the traces of the damaged area at the relevant pads and use jump wires between the 2 points, I'm no experienced service guy just a confident assembler so any advice here would be great. What Ic is IC3 ? Do you use 4049UBE ? In normal mode with just the BD on the rail I was still experiencing alternating loud and quiet accents with a single accented BD note. Next I just programmed an unaccented note and I could hear nothing. This reminded me that I had problems when first testing the Yocoto calibrating the DAC, here I'm only getting 9v instead of 13v. I set it in to voice test mode and measured again and found 9v, I've checked all the work in the area swapped IC's, pulled and measured the trimmer, measured 5v on the 4822 and still with the trimmer turned all the way counter clockwise I just get 9v. I'm using a TL072CP at IC6. What could be the cause here? What value you measure at IC118 Pin8 in Voice test mode (jumper in 1-2 position) ? 4.070v at pin 8 IC118. I had a grounding issue on the main board, where the previous builder had tried to desolder the PSU header damaging the +12v trace to the rail and also the ground. I'm not sure how I missed this as I had already repaired the +12v trace when starting work and must have confirmed continuity to the ground plain (or maybe not ??? ).